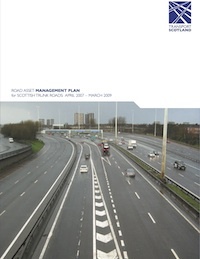 The Transport Scotland – Road Asset Management Plan for Scottish Trunk Roads is available here. The Road Asset Management Plan (RAMP) beings with the agency objectives and targets, based on customer expectations. The plan then describes the asset inventory, current asset management practices, current and future demand, performance management, and risk management. The RAMP also describes decision-making processes including lifecycle plans, decision support, and processes reviewing the RAMP. This document also contains a work plan and financial plan for the upcoming year. This document includes the following sections: Asset Valuation, Communications and Reporting, Financial Plan, Future Demand, Introduction, Levels of Service, Objectives and Measures, Performance Assessment, Process Improvements, Risk Management.